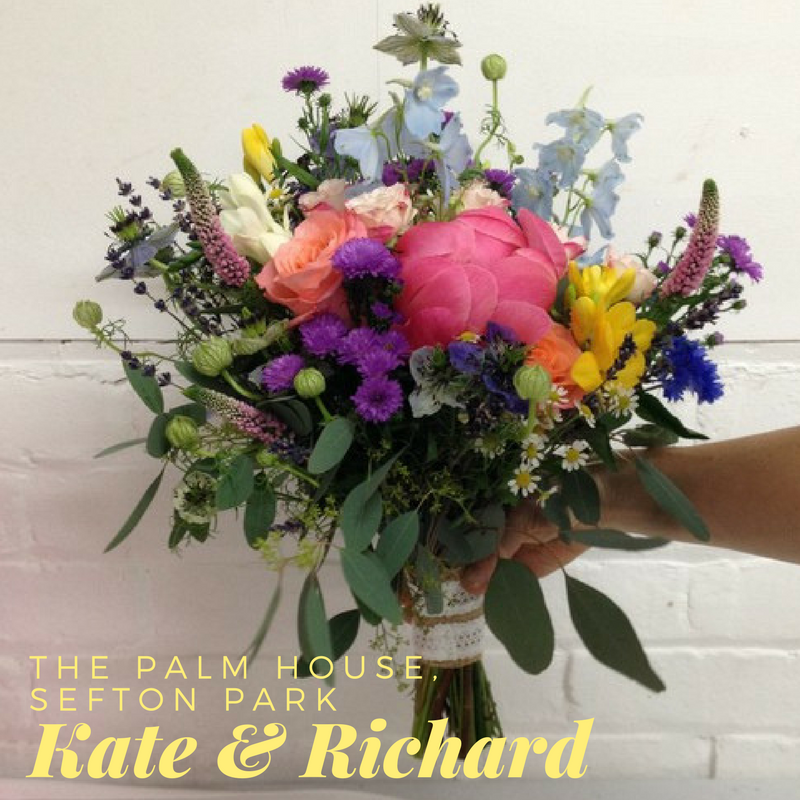 Kate and Richard were married in the Summer at St Barnabus Church and then onto The Palm House in Sefton Park. They had a beautiful Summer wedding with flowers to match the season. Full of colour and flowers - the bridal bouquet was made up of Tanacetum, Aster, Sweetpea, Freesia, Cornflower, Nigela, Peonies, spray Roses, Veronica, Thlaspi, Delphinium, Stocks, Snap Dragons, Lavender, Ivy, Eucalyptus, Pistache and Amaranthus! Kate chose a colour theme of deep coral pinks, blues, purples, yellow and creams. Kate also wore a gorgeous bridal hair circlet in the same flowers, with arrangements made to hang on the back of the Bride and Groom's chairs at the wedding. Her bright and colourful wild and just picked country garden top table flowersalso looked stunning set in the Palm House surroundings. To see the full collection, please click here to go over to the wedding website gallery.